The Children’s Learning Centers in Pontiac and Walled Lake offer a developmentally appropriate curriculum that focuses on each child’s natural curiosity and the teacher supporting the learning activity. Through group and individual activities, each child is encouraged to develop emotionally, socially, physically and intellectually at his or her own pace. Children learn to plan their work and put their work into action, which develops self-motivation and responsibility. Our Children’s Learning Centers are licensed childcare facilities that use the nationally recognized HighScope model of early learning and offer the Great Start Readiness Program (GSRP) for eligible children. We provide high-quality childcare and preschool services in Pontiac for children age 12 months through 5 years and in Walled Lake for children 4-5 years old. A school-aged summer program also is offered for children up to the age of 12 at our Pontiac location. The Children’s Learning Centers are an invaluable source of support for children and their families. Extended childcare services are available in Pontiac 6:30 a.m.-6 p.m. and Walled Lake 7 a.m.-6 p.m., Monday through Friday. For more information, please call our Family Service Specialist at (248) 858-7766 ext. 1254 or email us at aliegghio@ofsfamily.org. The Walled Lake Children's Learning Center is STILL ENROLLING for FREE preschool and spots are still open for tuition-based preschool at the pontiac children's learning center! CLICK HERE to secure a spot for your 4-year-old! 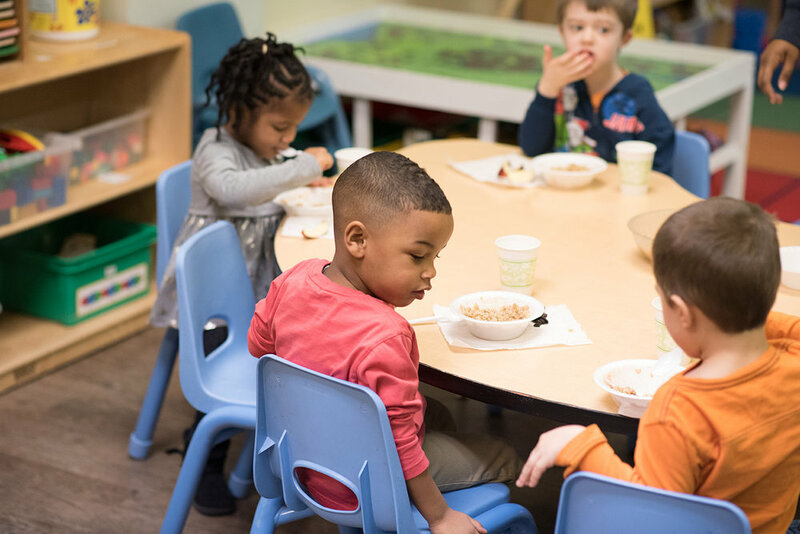 The Great Start Readiness Program is a state-funded, free preschool program for qualifying 4-year-old children at risk of educational failure. The program, offered at Oakland Family Services’ preschools in Pontiac and Walled Lake, uses the HighScope curriculum, a nationally recognized model of early learning. Children attend class all day, Monday through Thursday, with affordable options for before, after and Friday childcare available. Parent participation opportunities, family support services and resource and referral networks are some of the benefits of the program. Priority for open spots in the program is given to children who turn 4 by Sept. 1, but available spots may be available for children who turn 4 by Dec. 1. To qualify for GSRP preschool, families must meet certain income requirements. For more information about the GSRP program, please contact our Family Service Specialist at (248) 858-7766 ext. 1254 or via email at aliegghio@ofsfamily.org. The Early Learning Communities PROGRAM offers free training, resources and support to anyone who cares for young children, birth through 8 years old. Our Early Learning Communities program creates safe, friendly places for learning, sharing and making new friendships – places where you will be welcomed like family. Services include HighScope inspired training valid for Child Development Associate hours; Great Start to Quality help for childcare providers wanting to improve their star rating or parents interested in finding childcare; toy and resource lending libraries in Pontiac, Berkley and Walled Lake; Play and Learn caregiver/children interaction groups; and free childcare during classes. Early Learning Communities provides free programs for parents that will help your child develop social and emotional skills while strengthening your relationship with your child. Programs include Parents Interacting with Infants and Toddlers (PIWI), Family's First Year Conversations, Play and Learns, and The Incredible Years: Incredible Babies. In addition, Positive Solutions for Families, a workshop just for parents, focuses on how you can use positive approaches that will help your child learn and grow. Parents and caregivers can take advantage of these resources to make sure that the children in their care start school prepared and ready to learn. Early Learning Communities are offered at Oakland Family Services in Pontiac, and the Children’s Learning Center in Walled Lake and other locations in the community. The program is funded by United Way for Southeastern Michigan and Early Childhood Investment Corporation. Learn more about Early Learning Communities programs for parents.